Eat Well for Less: Healthier cheesecakes. Cheesecake. It’s tasty, but it can be pretty high in calories. Now whilst I totally do not advocate calorie counting regularly, I do like having healthier alternatives to foods like this that mean I can make them without it being an extravagance. 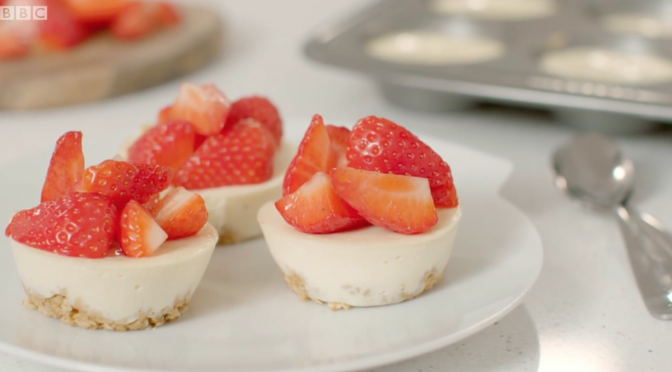 So here is the much asked for recipe for those cheesecakes we made on Eat Well for Less. I made this for Christmas and it made a great lighter dessert. Here is the video clip of Gregg, Chris and I in action making it. Here is the recipe in all it’s glory. Preheat the oven to 170C/150C Fan/Gas 3½. Lightly grease a 12-hole muffin tin with some oil. Put the remaining oil and honey into a saucepan, heat until warm and runny. Remove from the heat and stir in the oats and mixed spice until completely coated. Divide the oats between the muffin tin holes, pressing down on the mixture to make a solid base. In a large bowl, mix together the yoghurt, cream cheese, vanilla extract, lemon zest, stevia, sugar and cornflour. Mix the eggs into the cream until smooth. Spoon evenly between the muffin holes on top of the oats. Bake for 15 minutes or until just set. (They should still wobble a little.) Set aside to cool to room temperature. Carefully remove the cheesecakes from the tin and top with fruit of your choice. Serve immediately or transfer to a sealed container and keep in the fridge for up to 3 days. Truvia is fine to use in this recipe or you could swap the Stevia for another sweetener of your choice.